How to Blue Prism a process? Yes, soon this phrase will become very common rather than how to use Blue Prism’s Digital Workforce to deploy Robotic Process Automation (RPA) in order to automate the process. Reacting quickly to market opportunities and consistently producing delightful customer experiences is key to success in this fast-moving digital world. However, many organizations are stuck with complex business processes and legacy business operations that slow them down. RPA is the application of technology that provides organizations with a digital workforce that follows rule-based business processes and interacts with the organizations systems in the same way that existing human employees currently do. I started my journey in RPA back 2012, when I delivered my 1st engagement with a global bank where I successfully deployed RPA to automate manual processes across various customer facing and back-end banking operations. I recently had an opportunity to attend a Blue Prism ROM Masterclass: Delivering RPA at Scale on Thursday, March 1, 2018. The event coincided with one of the biggest festivals that is celebrated with joy across India (i.e. the festival of colors namely HOLI, we witnessed the full house with 130+ attendees at the event held at JW Marriot Hotel, Bangalore). 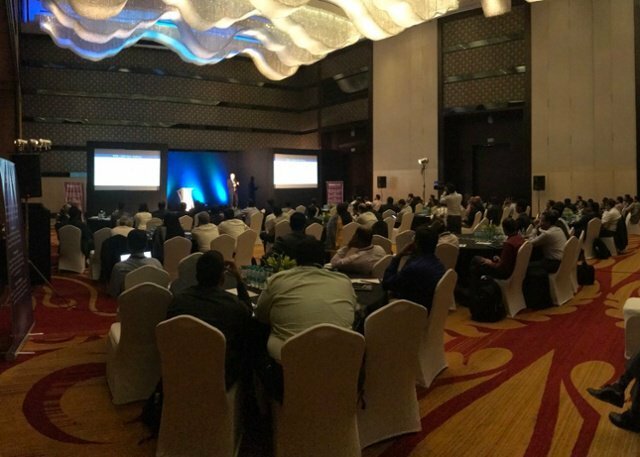 The event started with the opening remarks and as welcome note from Neeraj Gakhar, VP Global Strategic Partnerships and Head of Sales for Blue Prism in India. Neeraj apologized for not being able to accommodate 250+ waitlisted registrations, there were 145 people attending this event. Along with Neeraj from Blue Prism, the event was attended by Neil Wright, Executive Vice President, Professional Services; Richard Hilditch, Chief Robotic Operating Model (ROM) Architect; Bindi Basan, Head of Professional Services, APAC and Shail Khiyara, Chief Marketing Officer & Experience Officer, Blue Prism. Post, Neeraj’s session, 1st speaker was Neil Wright, who mentioned that Blue Prism is not only the “inventor” of ROM but an organization that has delivered multiple projects with running over 1000+ software robots. In 2001, Blue Prism was co-founded by Alastair Bathgate and David Moss, and has been pioneering Robotic Process Automation (RPA) ever since. Based on +10 years of customer experience, Blue Prism has delivered enterprise grade RPA across multiple geographies and industries. The company is acknowledged not only as the “inventor” of RPA but as the market leader as well. The product has been continuously evolving to reflect latest learning setting the standard of rolling out of RPA at scale across the globe. Blue Prism has a strong partner network and a user-friendly training program. Blue Prism technology eliminates costly and manual processing steps and time-consuming integration by providing a scalable, accurate and secure digital workforce. To deliver and maximize business benefit across the enterprise. ROM is a framework and operating model with a vision to create a digital workforce in organization. Identify, quantify and prioritize processes for automation. Today, most of the people don’t know their processes that well they think they know their processes. Maximizing the business benefits with RPA requires cultural adoption across the organization in conjunction with building the skills and procedures required for the digital workforce. MetLife, Nokia, Northern Trust, Mashreq, Shell who are supported through the company’s partner ecosystem. Post Neil’s session, we had Ganesh Iyer, CEO India Operations from Symphony Services which is a GOLD PARTNER with Blue Prism. Symphony Services is into consulting, implementation and managed services. Ganesh stressed that in Symphony they follow SAVO (Simplify, Automate, Virtualize, Orchestrate) methodology. Later, another session, Richard Hilditch, Chief Robotic Operating Model (ROM) Architect, from Blue Prism spoke about RPA Capability Creation. Richard stressed that confidence breeds success and success breeds growth. Post Richard’s session, Vijay Shankar, Partner EY who was an external speaker at the event spoke about EY being a Platinum Partner with Blue Prism for Capability and Gold Partner for Service having already deployed 400 software robots running internally along with 600 running externally across different clients. He emphasized that before deploying and running software robots at client’s location, you should develop internal expertise saying, “walk the path, before you preach”. Vijay stressed that building a delivery capability is easier but driving that organization wide is difficult. The companies need to think both pre- and post-production, how to manage the bots. It’s better to start with a business process – a quick win that’s easy to implement. At this stage, you need to demonstrate that RPA works and delivers real returns. This will enable CXOs to embed RPA, help their organizations to develop confidence and adopt the ROM culture to scale up the bot deployments and realize benefits by Blueprisming their process without any leakage in efficiencies. Vartul Mittal has 11+ years of strong Global Business Transformation experience in Management Consulting and with GICs with a remit to drive understanding and deliver Business Operations & Technology Strategy solutions globally. He has lived and worked across multiple countries and cultures involving senior client stakeholders from various industries like Financial Services Sector, FMCG and Retail. He has delivered engagements for Fortune 500 organizations such as Coca Cola India, Kotak Mahindra Bank, IBM, Royal Bank of Scotland, Standard Life Insurance, Citibank and Barclays. Vartul Mittal is also renowned speaker on Robotics Process Automation, AI and Innovation among Top Universities and International Conferences.